Over 30 miles of mostly single-track trails wind through the Air Force Academy and Farish Recreation Area for hiking, running, mountain biking, and equestrian use. Trails on the western side of the base also connect to an extensive network of trails in the Pike National Forest for exploring the Rampart Range area. El Paso County's New Santa Fe Trail easement parallels Interstate 25 and Monument Creek for 7 miles through eastern portions of the base, connecting the Tri-Lakes area (Palmer Lake, Woodmoor, Monument) and northern Colorado Springs for recreation and non-motorized commuting. A large-scale map of the trail system is shown here, with information provided below for specific trails. Map kiosks are also located at trailheads and along the Falcon Trail. We suggest using the HikingProject.com or Mountain Biking Project.com websites and mobile app for viewing and downloading digital maps and other information for each trail. 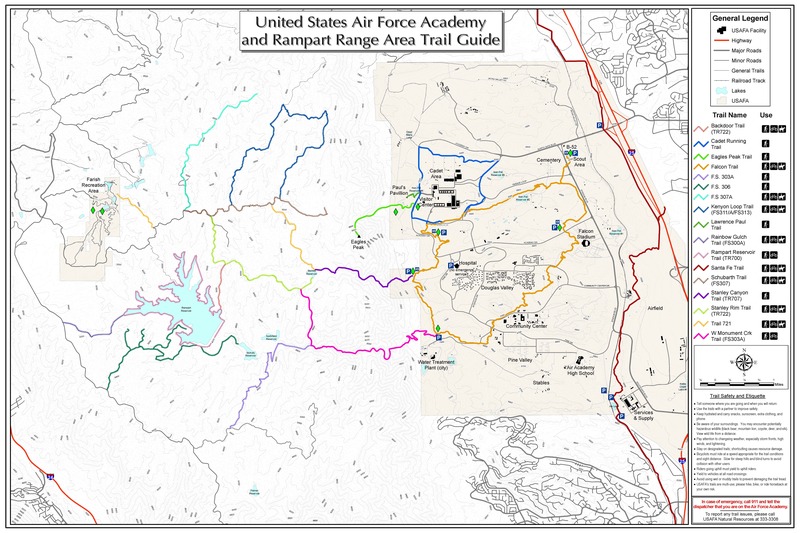 Public access to the Air Force Academy's trails and trailheads varies and may be restricted due to the base's Force Protection conditions and random security measures. 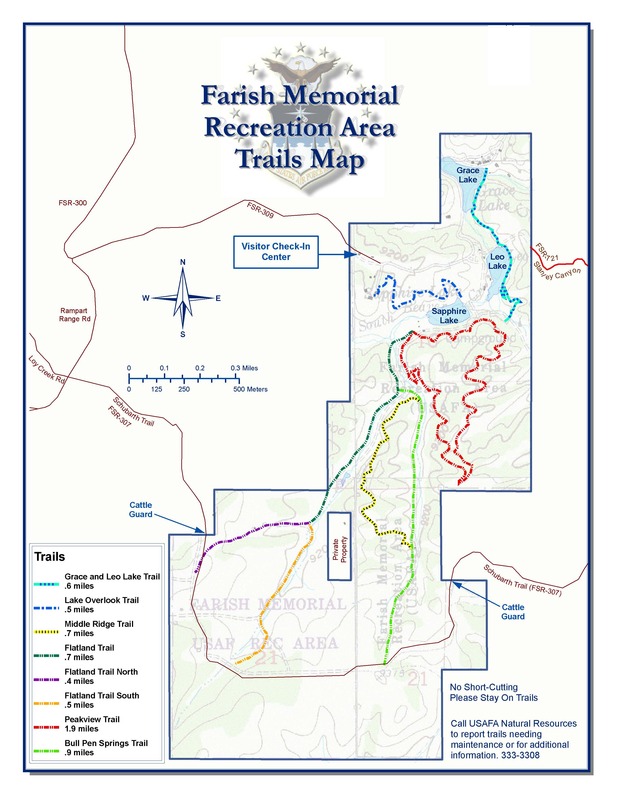 Farish Recreation Area is not open to the public; the trails are only accessible to registered patrons of Farish. Cyclists must wear a helmet and ride at speeds prudent for the trail conditions and safety of other users. Trail users are encouraged to recreate with a partner or in a group, but the previous "buddy" requirement is no longer in effect. Using earbuds or headphones on the trail is highly discouraged because of the possibility of encountering hazardous wildlife, including black bear, mountain lion, coyote, and rattlesnake. You should be aware of your surroundings at all times; watching out for wildlife, trail hazards, and other users. Protect the Trail Tread! Wet or muddy trails should be avoided to prevent unnecessary wear-and-tear. If you are leaving deep impressions with shoes, tires, or hooves, please find a drier section of trail or recreate on another day. Moving off-trail to avoid wet and muddy areas damages soil and vegetation and creates undesirable trails. The Falcon Trail travels through a variety of terrain and natural habitats, offering abundant opportunities to view wildlife and scenic vistas of the Air Force Academy grounds, Rampart Range, and eastern El Paso County. A clockwise route is generally considered to be less strenuous for cycling. The 0.7mile Falcon Spur Trail begins near the Northgate B-52 display and Youth Camping Area and connects to the main trail south of the cemetery. Parking is recommended at the B-52 display, Falcon Stadium north lot, and Chapel Overlook off Academy Drive. Port-a-John's, trash cans, and picnic tables are located around the trail; drinking water is only available in the Community Center area. Hiking to Stanley Reservoir on the Stanley Canyon Trail is one of the more popular hikes up the Rampart Range and into the Pike National Forest. The trail starts off steeply through pine/oak and spruce/fir forest and then climbs more gradually along the Stanley Creek riparian area. Stands of aspen and grassy mountain meadows appear near the final approach to the reservoir. Camping and open fires are prohibited around the lake by Colorado Springs Utilities, but camping is allowed on the adjacent US Forest Service land. Parking and a Port-A-John is available at the end of an unpaved road west of the Medical Clinic, but the road is only accessible with DoD identification because of a controlled security gate. Visitors should park at the Medical Clinic and hike west 0.6 miles on the unpaved road to reach the trailhead. Due to the state engineer's concerns with the integrity and safety of the dam, Colorado Springs Utilities has released all of the water in Stanley Reservoir. The long-term status of the reservoir, which is not part of the CSU water supply system, is unknown. Caution! Ice formations across the steep, rocky crossings of Stanley Creek can be extremely hazardous. 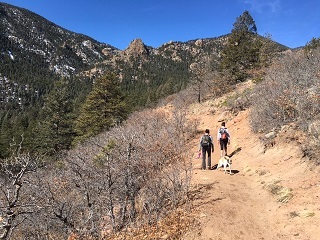 A hike up the West Monument Creek Trail offers the most gradual climb into the Rampart Range from the Air Force Academy. Parking is recommended at a small dirt pull-out on West Monument Creek Road, just east of the gated entrance to the Colorado Springs Utilities (CSU) water treatment facility. A short hike on an unpaved road from the parking area leads to West Monument Creek and an intersection with the Falcon Trail. Bearing southwest from a kiosk in a grassy meadow, the trail heads uphill to the Academy's boundary and into the CSU facility. Signage along the paved roads direct hikers through the CSU facility and back to a single-track trail on the Pike National Forest. Blodgett Peak (9426') and forest burned by the June 2012 Waldo Canyon Fire are visible from the trail. Birders occasionally see golden eagle, prairie falcon, and peregrine falcon soaring above the peaks and canyon. East of Northfield Reservoir, TR 713 turns northward to Stanley Reservoir and TR 722. The connection with TR 722 provides a loop option back to the parking area via the Stanley Canyon Trail and Falcon Trail. Identified on USGS maps as North Peak (9368'), "Eagle Peak" and most of the Eagle Peak Trail is located in the Pike National Forest. The trail begins near the Academy's western boundary, but it is not an officially recognized by the US Forest Service, so the trail does not receive routine maintenance. It is important that hikers stay on the established path to prevent further damage to the soil, vegetation, and wetlands. The trail climbs steeply (average 25% grade) with 2000' of elevation gain though dense spruce-fir forest along Goat Camp Creek to an open, rocky summit with expansive views of the Front Range, Air Force Academy campus, eastern Plains, Pikes Peak, and Tarryall Mountains. On clear days, downtown Denver and Denver International Airport are visible to the north. Parking is recommended at the Visitor Center; from there it is a 0.3 mile hike up Pavilion Road to a trailhead kiosk. Caution! People hiking off-trail or climbing around the summit and face of North Peak have been seriously injured or killed. Air Force Academy cadets are prohibited by the Commandant of Cadets from climbing on North Peak's steep exposures. El Paso County's New Santa Fe Trail easement parallels Interstate 25 and Monument Creek for seven miles through eastern portions of the Air Force Academy, connecting the Tri-Lakes area (Palmer Lake, Woodmoor, Monument) and northern Colorado Springs. Portions of the trail also follow the right-of-way of the historic Atchison, Topeka, and Santa Fe railroad. The wide, gravel trail offers a panoramic view of the Rampart Range and Air Force Academy grounds, and sections along Monument Creek skirt some of the best remaining riparian habitat in the region. Parking is recommended in the County's lot outside the Air Force Academy's Northgate entrance (Exit 156). Parking is NOT suggested at the Ice Lake Trailhead because trains frequently block egress from the parking area lot, often for several hours. All of the Farish Recreation Area hiking and mountain biking trails take off from the west end of Sapphire Lake and enter the backcountry. Click here for a map. Winding through mountain meadows and mixed-forests of pine, fir, aspen, and spruce, the Peakview Trail offers incredible views of the Farish Recreation Area backcountry and Pikes Peak. Most of the grade is gradual, but there are a few short sections of steeper trail. Although tempting, please do not cut across the environmentally sensitive wet meadows to connect with other trails. The Bull Pen Springs Trail heads east from the Flatland Trail at 0.2 miles and then quickly turns south toward the Shubarth Road (FS 307). This faint, well-vegetated trail gently takes you through a grassy mountain meadow, passing the remnants of an old ranching corral near a southern connection with the Middle Ridge Trail. Heading out from Sapphire Lake, the Flatland Trail provides easy access to other connecting trails to explore the Farish backcountry. At 0.7 miles the main trail forks to the Flatland Trail North or Flatland Trail South, which both end at the Schubarth Road (FS 307) after another 0.4 to 0.5 miles. Following the Schubarth Road east to the Bull Pen Springs Trail provides a scenic loop route back to the Farish facilities. Taking off from the middle or northern end of the Bull Pen Springs Trail, the Middle Ridge Trail gradually gains elevation to a ridgeline forested with spruce, fir, and aspen.